As soon as I put down my copy of Swan and Shadow, my head was swirling with creative thoughts and plausible ways in which Ms Olsen approached writing her after canon sequel on behalf of ‘Swan Lake’! I knew I wanted to work with the author directly to bring special guest features to Jorie Loves A Story, because her thought-provoking story deserved a special highlighting on the world-building and the manner in which she brought forward the original canon whilst giving it her own unique perspective on how best to tell Aislin’s story! As you will note from our conversation, we differed a bit on what can be drawn out of the story’s context, which is something I noticed more than one reader is struggling with resolving, as revealled on her Guest Post which ran earlier this week, as I kicked off a focus on ‘Young Adult Lit’. I think the margin of error on behalf of readers like me who see a connection which may or may not have directly been the conscience choice to include by Olsen, proves that for each story we conceive as a writer, the same story can be seen through a different spectrum of probabilities by the readers who drink in the story through their own interpretations. This is one subject that is quite actively blogged about in the book blogosphere by my fellow book bloggers as well as readily explored through the twitterverse! I think it speaks to the layer of depth novels can etch out of their central core of narrative inasmuch as how individual reading and writing becomes per each person who picks up a story – either from the creation of it or from the after effect of reading it. What inspired me to move forward with two guest features is to allow Ms Olsen the blessing of granting new readers the chance to become familiar with her writing style and her approach to granting new license of thought on behalf of a canonical piece which has resonated with fans of ‘Swan Lake’. 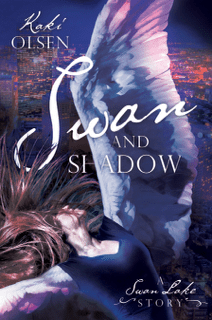 Enjoy her personal reflections on on Swan and Shadow! relationship with your twin is hard when your both moving out of adolescence and shifting into adulthood. Olsen gives such a good footing of where Aislin is right now in her ‘living story’ to inspire the readers who will pick up the novel and find a bit of hope by the time the last chapter concludes. Hope is worth everything in the end. In the original “Swan Lake”, the Black Swan represented the origin of Odette’s curse to live as a White swan. In your re-telling of the story within “Swan and Shadow” you’ve separated Aislin and Maeve by colour coding them: Aislin is White, Maeve is Black. Was this meant to be a nod to the canon or a greater hint towards the overall story? Olsen responds: If you take it at face value, this was inspired by the fact that Jodi Picoult writes her books from specific perspectives and puts the names at the beginning of chapters. I didn’t want it to be page after page of Maeve…Aislin…Aislin…Maeve. The original intention of the two codes is to plant a seed of doubt. In both the canon and the book, the black swan and white swan are separate entities and rather than use the black swan as a force of evil, I used her as an antagonist. This means that at times, Maeve will do something that works against Aislin’s intentions and plans and it varies whether or not she has any remorse for it. I could cite several examples, but in the interest of not giving away too much, I’ll point out that Maeve goes behind her sister’s back at one point to take the SATs for her and Aislin takes it as a major drama because it is something she would have never asked for or wished for. She sees it not as a betrayal, but an unacceptable kindness that she can’t reciprocate. This is one of the most minor ways to have someone be antagonistic.